Within aviation, the drive to create is infectious, and I caught the bug after my first visit to EAA’s Oshkosh Fly-In back in 1992. I spent the week with eyes wide open, amazed at the number of entrepreneurs and inventors touting new aircraft and technologies in the making. I knew at that moment that my life trajectory had changed forever. I spent the next 25 years working my way into and around the general aviation industry. I had both successes and failures, but, most importantly, I had some truly inspiring mentors. I became a pilot, an aircraft owner, an A&P/IA mechanic and an STC/PMA holder, all due to the encouragement and support of some truly remarkable human beings bound together by a love for aviation. The Titan T-51D Mustang is a ¾ scale version of the famous P-51D fighter, created as an amateur experimental aircraft kit. Experiencing the magic that happens when aviation enthusiasts gather together at fly-ins, pancake breakfasts, seminars, etc., led to the creation of SocialFlight. The theory behind SocialFlight.com and the free SocialFlight mobile app was simple: If we told pilots about all of the aviation events happening near them, they would be motivated to attend, meet new people and ultimately fly more. Aviation events are “perishable,” meaning that you either make the time to attend or you lose the opportunity. You don’t have the option of saying “maybe I’ll fly tomorrow instead,” which we pilots do too often. The theory turned out to be true, as evidenced by five years in operation, mapping out and emailing SocialFlight users with information about nearly 30,000 aviation events. And during that time, we’ve gotten hundreds of testimonials from happy users, both pilots and event organizers. We’ve added destinations, aircraft galleries and The FLY2WIN Challenge, where users can enter to win thousands of dollars of prizes just for flying and checking in at new airports and events. That said, our most popular addition by far has been SocialFlight’s educational webinar series, where attendees have learned about everything from avionics to engine management, aviation photography and much more. SocialFlight’s webinar series generated an outpouring of requests for even more direct engagement and educational content. The remarkably light-weight, four-bladed propeller is a composite design built in-house. As I walked the grounds of AirVenture 2017 with my two boys, Jake (15) and Ben (14), I was thinking about how we could do more to connect with the pilots around us. I was also thinking about how to “pay it forward” and inspire others to take their own leap of faith and take a shot at making their aviation dreams come true. That’s when we came upon the booth for Titan Aircraft and met Titan’s general manager, Bill Koleno, and you can probably guess where this is going. A machinist and designer by trade, Bill is the ultimate self-starter. In his high school shop class at the age of 17, Bill built his first aircraft, a gyrocopter, from plans. 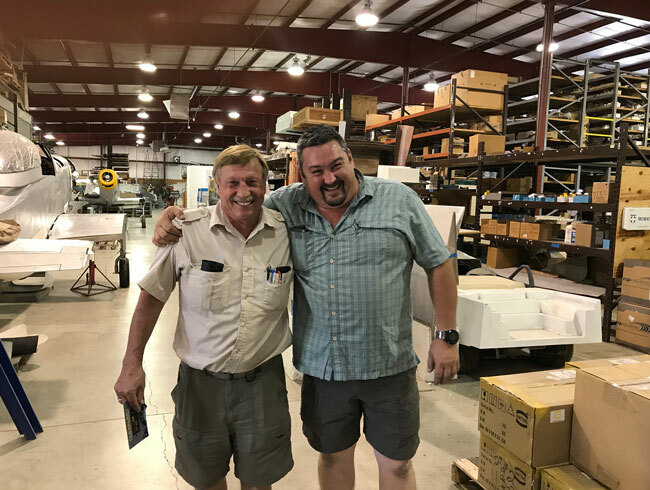 Years later, he happened to move in across the street from John Williams, owner of Titan Aircraft, and the two quickly became friends and business associates. Titan founder and CEO John Williams (left) with General Manager Bill Koleno (right). 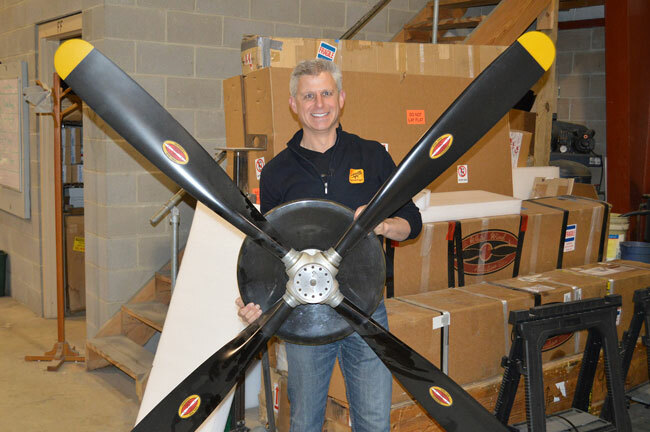 A passionate aviator, John got into the aircraft business by using the extra capacity of his industrial controls company to become a contract manufacturer for the CGS Hawk ultralight. His experience with the Hawk led him to create his own aircraft: the Titan Tornado. Like many pilots, John dreamed of owning a P-51 Mustang, but the financial realities of owning a warbird kept his dream just out of reach. 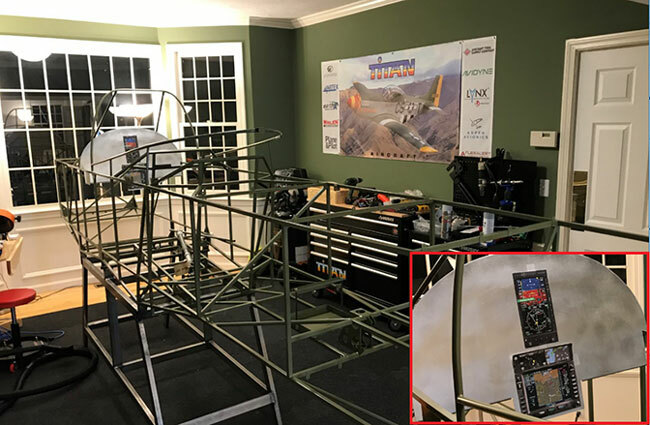 So John took it upon himself to design a ¾ scale T-51D Mustang replica that could be built and flown under the FAA’s Experimental Amateur Built regulations. John’s goal was to create a Mustang look-alike that was affordable, reasonable to build, easy to fly and loads of fun. John utilized many of the same structural principles employed in the Titan Tornado to build the T-51D Mustang. 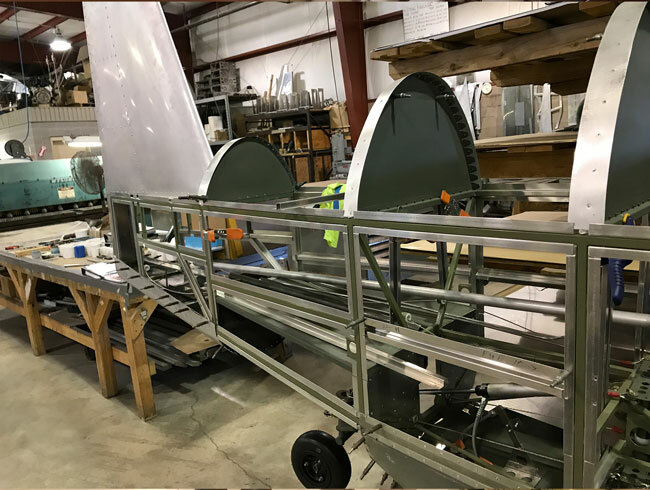 The fuselage is constructed of aluminum on a steel cage frame that comes complete from the factory. The center section comes with the landing gear pre-installed, and the leading edges of the wings are composite aluminum-over-foam construction that is incredibly strong yet light-weight and inexpensive to build. Estimated completion time for the average builder is 1,600 hours, not including avionics and paint. To date, well over 200 kits have been delivered to builders from around the world, and approximately 100 are flying, each one of them making someone’s “fighter pilot” dreams come true. The T-51D is built using aluminum skins bonded and riveted to aluminum “hat sections” that sandwich the steel tube frame. For years, I had walked past the display for Titan’s T-51D Mustang, imagining how much fun it would be to build and fly such a unique plane. Since my first visit to Oshkosh in 1992, I had been dreaming of someday building an aircraft. Becoming a father only intensified the desire to make this dream a reality because I saw it as the ultimate bonding experience: a father and his sons, building an aircraft together that would remain in the family for generations. With only four years left before Jake and Ben left for college, the time to do it was now. The plan came together during that conversation with Bill at AirVenture. By combining the forces of SocialFlight, our partner companies and Titan Aircraft, we would create a public build of this everyman’s Mustang, and that’s just what we’ve done. The goal is to make our project an entertaining and educational documentary, consisting of a regular stream of videos, interviews, blogs and more all designed to give pilots and other aviation enthusiasts the chance to see a cool homebuilt replica warbird come to life. 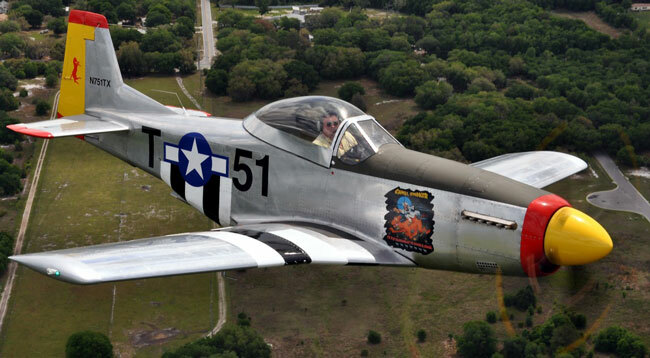 SocialFlight’s T-51D Mustang will be powered by a GM LS3 V8 Engine package. The engine produces 310hp at takeoff. The workshop for this project is the converted living/dining room of our home in Massachusetts. In addition to our own work on the project, we are hosting a series of special guest builders from throughout general aviation who will be sharing their stories and expertise. We have also scheduled video episodes featuring women in aviation and the introduction of kids and young adults to the world of aviation and aircraft building. After several trips to the Titan factory to meet with John and Bill, we were ready to begin our epic journey. Aircraft Tool Supply, Aspen Avionics, Avidyne, L3 Aviation Products, Lightspeed Aviation, Whelen Lighting, ACR/Artex, EarthX Batteries, Approach Aviation and, of course, Plane & Pilot all came together to support and promote the project. 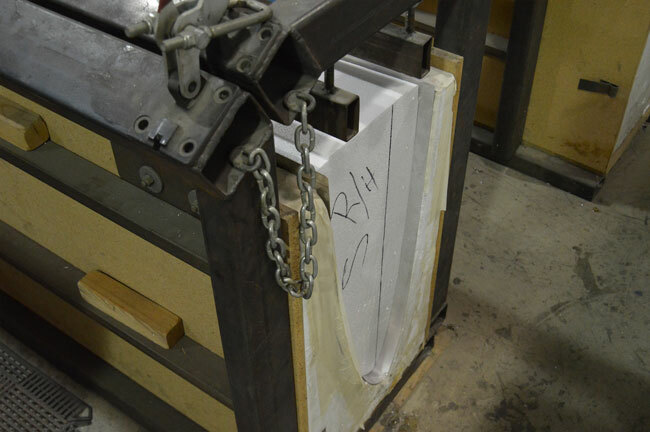 The leading edges of the wings are made from aluminum bonded around a foam core. We began filming in the fall of 2017 at the Titan factory, including some amazing video footage as we got to experience flying the T-51D Mustang first hand. Flying the Mustang put a smile on my face that still hasn’t faded. 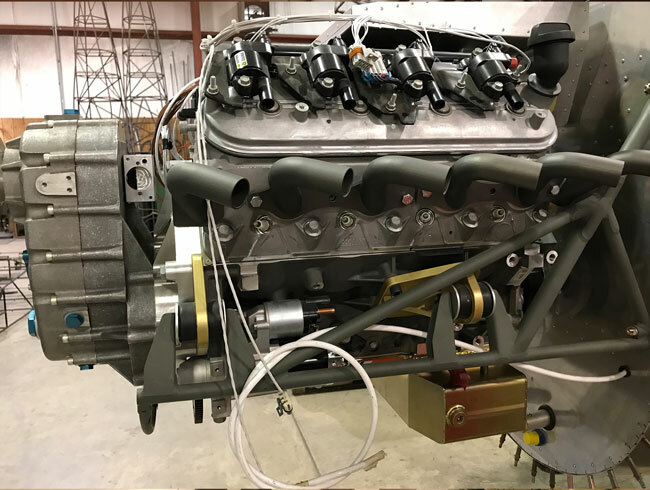 The roar of the 300+hp GM LS3 V8 engine—more on that to come—was matched by the thrill of the acceleration and climb out at over 3,000 fpm. The controls were wonderfully balanced and light, yet the aircraft was very stable and quite easy to fly. Part of our learning curve will surely be a healthy dose of tailwheel transition training, which will also be part of our video story. SocialFlight’s Mustang project resides in Jeff’s former dining/family room, converted to a workshop for the build. And now the real odyssey begins as we take viewers inside the process of building an aircraft at home. Along the way, we will also be teaching about avionics, aircraft lighting, tools and much more. Viewers will have input into our aircraft build and, through online participation and interaction with our team, some viewers may even win a flight in an actual T-51 Mustang, courtesy of Titan Aircraft. Aviation is the cumulative history of dreamers. Our hope is that we can use this build experience to inspire others to reach higher and make their own dreams come true. The journey has just begun, and we look forward to sharing more with you in future articles. You can follow our weekly progress and videos at: SocialFlight-T51.com. Jeff Simon is an A&P mechanic, IA, pilot and aircraft owner. He has spent the last 17 years promoting owner-assisted aircraft maintenance and recently certified the FlexAlert Multifunction Cockpit Annunciator (www.FlexAlertAero.com). Jeff is also the creator of SocialFlight, the FREE mobile app and website that maps over 20,000 aviation events, $100 Hamburgers and Educational Aviation Videos. Free apps available for iPhone, iPad and Android, and on the Web at www.SocialFlight.com. I got to say this is a project I definetly would be interested in. How we can fallow it?